Alevo's grid-scale storage assets are on the auction block. Administrators for Alevo are hoping to sell off the company’s assets “in the next couple of weeks,” interim group CEO Peter Heintzelman told GTM. The grid-scale battery maker filed for Chapter 11 bankruptcy protection last August but has remained operational while administrators looked for takers for the business, which is split between a Swiss parent group and a U.S. manufacturing base, Heintzelman said. 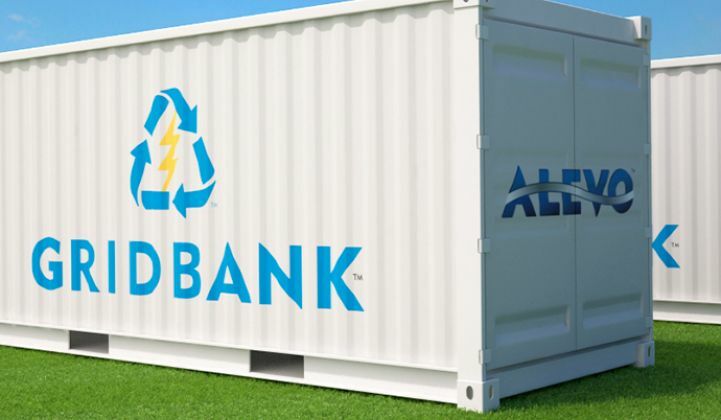 The Swiss firm controls the electrolyte production and intellectual property for Alevo’s GridBank lithium-ion battery. The U.S. arm, meanwhile, owns all the battery production equipment at a leased facility in Charlotte, North Carolina, along with the only existing commercial GridBank unit, which is delivering services to the PJM Interconnection ancillary services market. Heintzelman said there is “a great deal of interest” in Alevo’s battery technology, which is said to be nonflammable and capable of 50,000 cycles, as well as the U.S. production assets. Alevo is “rapidly working on restructuring options,” he said, and had already received offers from potential buyers that include a small European group with ties to major industrial players in Europe. He did not reveal how much Alevo’s administrators are looking to make on the sale. “Relative to the tremendous value of what this technology is set to create, because it is a distressed sale, the numbers are surprisingly low,” he said. According to Heintzelman, previous management in the U.S. failed to address fundamental issues in scaling up the manufacturing process. “They built a full-scale plant when they should have built a pilot plant first,” he said. The U.S. problems, which saw Alevo laying off 290 employees and ultimately brought down the Swiss parent, were not related to the battery design itself, he said. He also confirmed that Alevo had no bank debt when it filed for Chapter 11. The company’s Swiss management and employees are still in place, he said. Alevo’s assets are being handled by separate administrators in Switzerland and the U.S. It is unclear if any future buyer would want to invest in all the assets, or even keep the Alevo brand. The company’s main shareholder, which Heintzelman described as a private family office, is reported to be Dmitry Rybolovlev, a Russian billionaire. Alevo’s financing faced scrutiny last year. News of a potential sale raises the prospect that Alevo might follow a similar path to Aquion, another battery manufacturer that ran aground in 2017. Aquion, which raised $190 million in venture capital funding from backers including Bill Gates, filed for Chapter 11 in March last year but emerged under new ownership in July after a Chinese-backed investor, Juline-Titans LLC, paid just over $9 million for the business. Aquion, like Alevo, may have overextended itself by investing heavily in manufacturing capability before product sales had scaled fully. In 2014, Aquion took over a plant near Pittsburgh with a capacity of 200 megawatt-hours per year. Aquion won plaudits for its saltwater battery chemistry, which was seen as a viable competitor to low-cost lead-acid batteries in emerging and off-grid markets. And Alevo's GridBank performance was sound, said the company. Last October, the 2-megawatt/1-megawatt-hour GridBank deployed for PJM in Hagerstown, Maryland received a 98.5 percent compliance score from the regional transmission organization’s Performance Compliance Department, according to an Alevo press release. In January, the battery was expected to have made more than $87,000 through frequency regulation services to PJM, he said.